Ownership / Access: Currently houses a museum and a centre of cultural events. Notes: Castello Orsini-Odescalchi is a castle in Bracciano, in the Province of Rome, Lazio, Italy. It is located on the southern shore of Lake Bracciano. It was built in the 15th century, and combines the functions of a military defence structure and a civilian residence of the feudal lords of the period, the Orsini and Borgia, both papal families. As one of the largest and best-maintained castles in Italy, it also houses a museum; as a centre of cultural events, the Castello has hosted several high profile weddings. 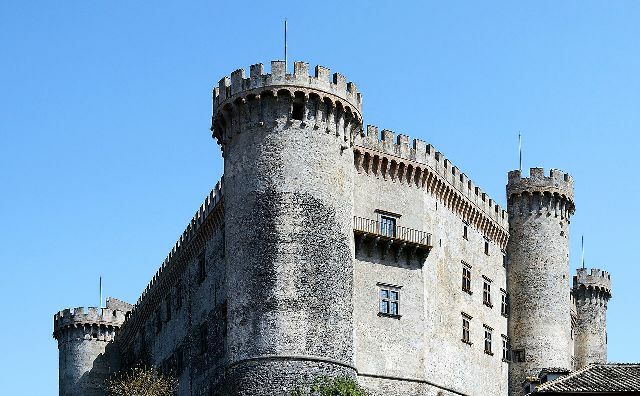 The Castello Orsini-Odescalchi is one of the most noteworthy examples of Renaissance military architecture in Italy and is the main monument in Bracciano. The castle underwent many renovations since its inception. In the castle, richly frescoed friezes and ceilings were created. Richly coloured tapestries were made when the lords of Bracciano were in residence. The important late 15th century frieze showing the labours of Hercules is still visible. The historical museum within the castle premises has valuable artwork from the Middle Ages of over six centuries rule of Popes and Kings, consisting of ancient weapons, furniture and paintings, books and manuscripts, frescoes and decorations. It was opened in 1952 by Prince Livio Odescalchi IV. The castle has hosted a number of events, especially weddings of wealthy actors and singers. Hollywood actors Tom Cruise and Katie Holmes were married at the castle and on August 27, 2011 Petra Ecclestone, daughter of billionaire Formula One supremo Bernie Ecclestone, married British billionaire and art collector James Stunt there.